I didn’t know this. In Africa, there’s a bird that will track a bee to its home, and then lead over a badger to crack open the hive, so that both of them can share the honey. 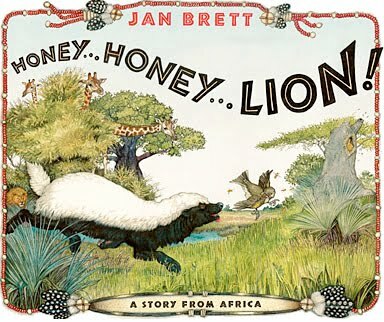 “That is the way it has always been,” writes Jan Brett in a wonderful children’s picture book. But as always, the star of this story is her detailed illustrations of all the animals. As with all her books, there’s a wealth of illustrations — including extra illustrations on either side of the page. There’s the giant tall trees on a grassy African Savannah. And she peeks in on all the story’s other animal characters, including the elephants and the hippopotamuses. But my favorite illustration shows the happy badger as he sleeps off his tremendous meal. He lies on his back — pointing his soft belly fur to the sky — while his pink-soled feet roll lazily to the side. It’s wonderful to see the scenery of Africa as the bird plays a trick on the badger. It flies past his home in the baobab tree, and over the hippopotamuses in the water hole. It flies over the warthogs by the termite mound, and past the jackals near a long hollow log. There’s a stand of papyrus, and a field of golden bristle grass — but the puffing badger, following behind, only wants to get to the honey. You have to lift a flap to see what’s hiding under the acacia tree. But there’s a big, yellow paw sticking out — and in a second set of illustrations at the sides of the page, two giraffes point their strange heads to watch with interest. “Honey… Honey… Lion!” reads the crucial line of dialogue. Then all the animals of the savanah start to run — the giraffes and the jacakals , and the elephants. And by the book’s last page, all the animals are now telling a different story — of how important it is to share your honey with the little bird who leads you there. “Be sure and reward her,” they say, over the “bush telegraph” that connects all the animals of Africa.